Millions of Americans tuned in early September to watch an American tradition: the Miss America Pageant. This year the Department of Communication watched excitedly as UConn Communications major Eliza Kanner took the stage as Miss Connecticut. As a senior, Eliza has been devoted to the Department of Communication for the past three years. She stated that upon entering college, she was unaware of which career path she wanted to go down. After getting involved with the Miss America Organization, she found herself learning public speaking skills, effective brand management, and gaining media, interpersonal, and mass communication skills. Her journey with Miss America pointed her in the direction of the communications field where she began to explore opportunities within the COMM Department. Eliza expressed that her favorite COMM class so far has been Computer Mediated Communication (COMM 4660W) with Professor Christensen. She found this class particularly interesting because computer mediated communication research is still fairly new and constantly evolving. The constant change and evolution of the study of communication has really sparked her interest over the course of her time at UConn. While taking COMM 4660W, she researched government officials on social media and its effects on society, where she was able to look at the benefits and setbacks of government officials on social media platforms. She stated that Professor Christensen has become a great mentor for her when it comes to her future career as well as her role in Miss America. She stated that since the beginning of the semester he emphasized that supporting students with their future was a priority of his. With help from COMM Advisor Joel Nebres, they created a program allowing for Eliza to earn credit for her role as Miss Connecticut. Eliza will now be fulfilling her duties not only as Miss Connecticut, but as a UConn Senior as well. In her role as Miss Connecticut, she will be making public appearances to represent the Miss America Organization as well as the state of Connecticut. Along with her duties as Miss Connecticut, she’ll be continuing her studies as a UConn Husky. To keep up with Eliza on her journey as Miss Connecticut, you can follow her on Facebook (@MissAmericaCT), Instagram (@missamericact), and Twitter (@MissAmericaCT). The Department of Communication is proud to have students like Eliza, who strive to take their degrees above and beyond what is asked of them. The field of communication is broad, but once students use their degrees to enhance their passions, they accomplish great things. As the new school year begins, members of the Department of Communication are undergoing exciting new research studies. Associate Professor Amanda Denes was just awarded a Waterhouse Family Institute (WFI) grant which will allow her to design and conduct a new research study on campus. WFI is a communication research institute, housed within Villanova University, where it funds research projects that focus on interconnections between communication and social change. Not only did Professor Denes receive the grant, but she received the largest single grant that WFI has ever provided. Professor Denes, along with her main collaborator at the University of Washington, John Crowley P.h.D., will be studying the effects of positive affirmation towards sexual minorities who have been affected by hate speech. The study will ask members of the LGBQ community to share an experience that they have had with hate speech with their friends. The friends will then be trained to give good support or no support to their friend. The researches will be measuring physical stress by observing hormones to see whether or not communication intervention from friends can dampen stress. Professor Denes has received support from the UConn Rainbow Center, and she is hoping to provide information about how to communicate effectively with victims of hate speech. Professor Denes feels that this is an important issue to be studying because hate speech is on the rise, and there’s a lot of negative sentiment towards many groups including the LGBQ community. There are many allies to this community that want to know how to be better allies, and what they as a community can do to help. There are also potential health benefits to this study, as stress can cause people to become sick. 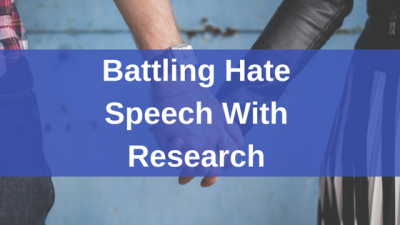 The study seeks to find ways to improve the mental and physical health of those being affected by hate speech by teaching allies how to communicate with them in an affirming way. Currently, Professor Denes is designing the study and awaiting approval in order to start collecting data in the spring. Additionally, she will be looking for lab students to assist with her research.. If you are interested, email Professor Denes at amanda.denes@uconn.edu.